Known to Eat: Fondues and Don'ts. Musings on Food History and Culture. Originally published Gazette Newspapers, October 2003. Updated October, 2013. Most things from the seventies are forgettable. Disco, platform shoes, pet rocks, waterbeds, Kiss, ELO, and shag carpet come to mind but some things like the Atari 2600, Saturday mornings with Sid and Marty Croft, punk rock, and fondue parties have a fond place in my heart. 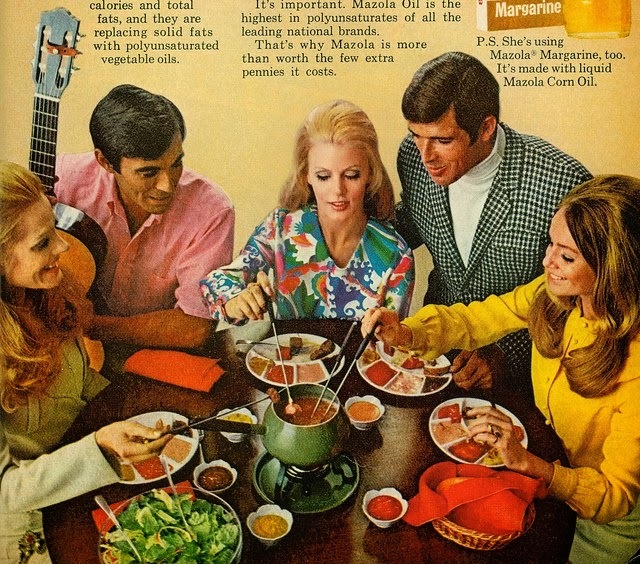 Yes, the fondue party, molten cheese, open flames, and slightly inebriated guests with sharp forks, sounds like a recipe for disaster, but it’s actually a formula for fun. In recent years, fondue, like bellbottoms and platform shoes, has made a comeback. In fact, fondue pots have been one of Williams and Sonoma’s and Amazon's best sellers during the holiday season. Fondue parties are becoming all the rage and many top chefs in New York and Los Angeles have added fondue to their menus. And why not? How can you go wrong with melted cheese and bread, or melted chocolate and pound cake? While many of us associate fondue with '70s gourmands like Graham Kerr and Julia Childs it actually has more humble beginnings. Fondue probably originated during the middle ages in Switzerland (although some Asian cultures and the Greeks also claim to have invented it) as a way for peasants to use up hardening cheese and stale bread. During long Swiss winters peasants had to rely on the food they produced during the prior fall. By the end of winter the cheese and bread was stale and unusable. Industrious and probably starving, these peasants found a way to use these seemingly useless ingredients. Traditionally fondue was made with a mixture of Emmenthaler (Swiss Cheese) and Gruyere cheeses, cooked in pot called a caquelon (a heavy earthenware dish) with wine and sometimes a splash of kirsch or cherry brandy. The ingredients and amounts of each cheese differed by region. 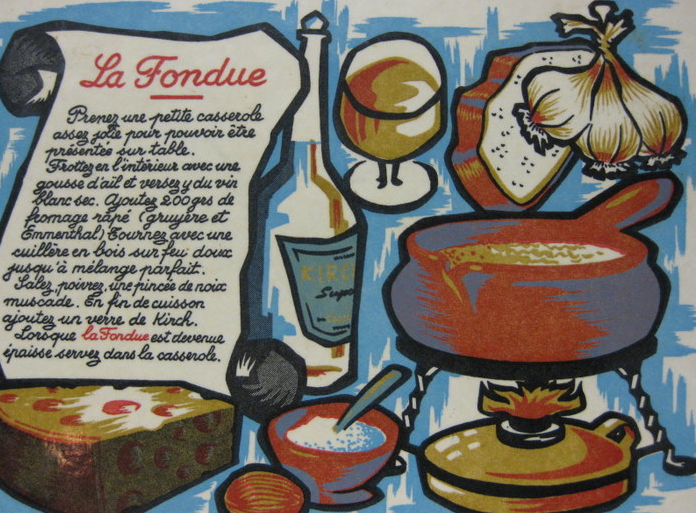 Each canton in Switzerland had their own style of fondue, each using local cheeses and wines and other liquours. The people from the canton of Fribourg, for instance, use gruyere and vacherin and use plum schnapps instead of wine, while cooks in Eastern Switzerland use appenzeller and vacherin cheeses combined with dry cider. The French and Italians both borrowed fondue from the Swiss and introduced it into their cuisines in the 18th and 19th centuries. The famous French gastronome Billat-Savarin first wrote about fondue in the mid nineteenth century. But, fondue found its place in U.S. cuisine in 1956, when Swiss chef Konrad Egli introduced fondue to his Chalet Swiss restaurant customers. Since Egli’s introduction of fondue to Americans, cooks here have been even more creative than those hungry Swiss peasants, using all of the traditional Swiss recipes as well as inventing fondues of their own. A search through fondue recipe books yielded traditional cheese and wine fondues and hot oil or broth fondues for dipping thinly sliced raw beef. More off-beat recipes include deep-fried dill pickle fondue balls, hot crab fondue, Mexican black bean fondue, and for those with a sweet tooth, toffee fondue, chocolate fondue, peanut butter fondue and even a hot crème en glace and Gran Marnier fondue. The most intriguing and also most frightening recipe I came across was one titled “American Fondue.” In this recipe the wonderful Swiss cheeses are replaced with the industrially processed cheese that as kids we used as fish bait, Velveeta. Into the melted Velveeta cheese, add 2 cups of milk and 1/4 cup of flour. Then add a 1/2 a package of Lipton’s Dry Onion Soup mix and a jar of pimentos. When melted and hot, transfer to a fondue pot to keep warm. If this isn’t bad enough the recipe's author suggest dipping hot dogs or polska keilbasa into this foul concoction. If this version of "American fondue" doesn’t sound all that appetizing, the traditional one is quite easy to make and very tasty. Toss together three cups of shredded Gruyere with 2 cups shredded Emmenthaler cheese, and three tablespoons of flour or cornstarch. Heat 1 1/2 cups of dry white wine in a heavy sauce pan over a medium heat until just before boil. Reduce the heat to low and add the cheese and flour mixture a little at a time until it is all incorporated. Continue to stir until mixture is smooth and bubbling. Stir in 1/4 cup of milk or cream and 2 tablespoons of kirsch. Add 1/8 teaspoon of nutmeg and white pepper and transfer this mixture to your fondue pot and keep warm with fondue burner. Bring the fondue pot to the table and start dipping. While crusty bread is the traditional dipping medium, be creative. At the fondue party I attended recently we dipped bread, vegetables, and gourmet sausages. Remember everything is good with melted cheese. But before you let your guests dip their first piece of bread, remind them of the all important fondue fon’don’ts. In other words, teach your guest proper fondue etiquette. Given fondue’s communal nature there are a few rules one should follow so as not to gross out your guests. To eat fondue spear a piece of bread or other dipping medium with you fondue fork (each guest should have their own fork), twirl the cube gently to coat it and allow a few seconds for the excess to drip. You don’t want to drip molten cheese on yourself or your hostess’ table. When you put the piece in your mouth do not touch the fork with your lips or tongue (this is just bad form and it might freak out other guests). Alternatively, you can slide the dipped piece off your dipping fork and onto a small serving plate were you can then pick it up with a proper fork. For me this is an unnecessary step, but for a close friend of mine this step is a must and any other way of eating fondue is just plain disgusting. If you want to experiment with other fondues and I suggest you do, epicurious.com has some fantastic recipes all of which are sure to please even your most finicky guests. While the fondue is important to the fondue party’s success, it’s also important to remember that the true joy of the fondue party is the fact that the host isn’t stuck in the kitchen all night cooking and can share in the conversation, laughter and joy of the nights festivities.